This application would consider creating 9 building lots for single detached dwellings on 0.6 hectares (1.48 acres) of land, that would be serviced by municipal water and sanitary sewers and fronting onto Union Avenue. The light-coloured box is where the 9 homes would go, if approved. If this proceeds, it would complete the development along Union Ave. 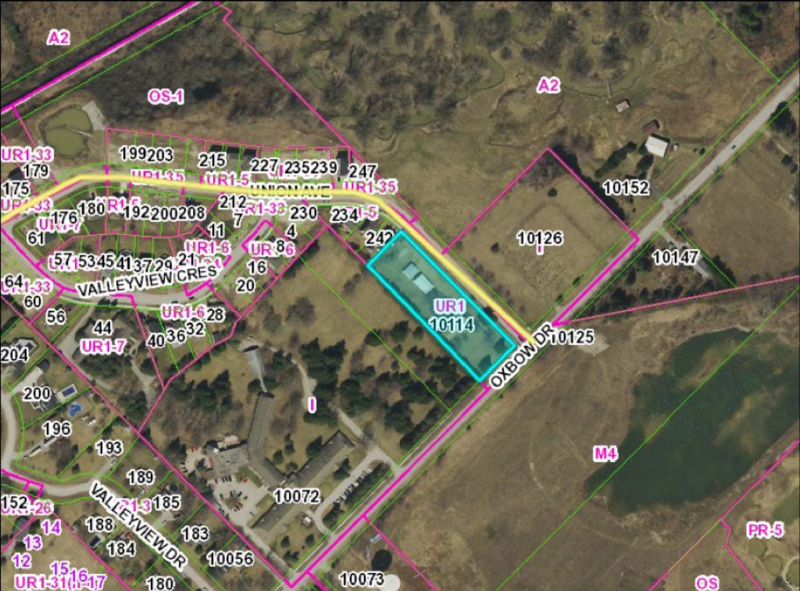 The portion marked A2 above (10152 Oxbow Drive) is privately owned property with agricultural zoning, and 10125 Oxbow Drive (bordered in pink) is a cemetery. I highly doubt either property will de altered any time soon. 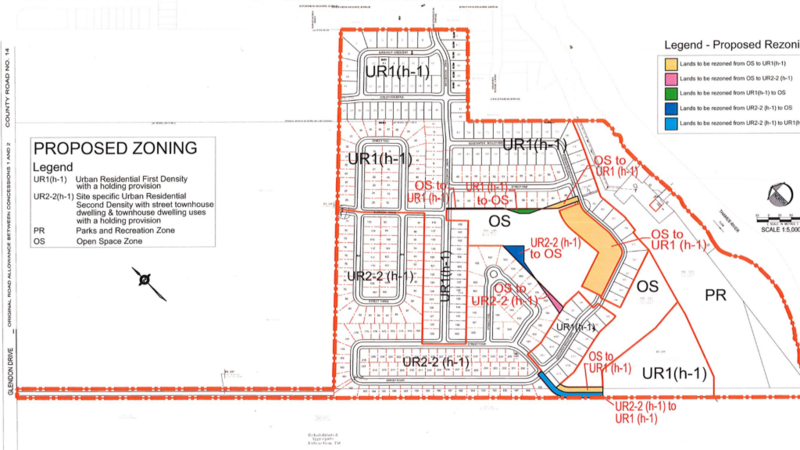 Southwinds has requested that the remaining phases of the development be subject to an amended plan of subdivision and also that the zoning of the property be changed to reflect the requested amended plan of subdivision. Specifically, Southwinds is proposing to develop the residential development blocks for single detached dwellings as well as make changes to the road network and various blocks. If approved, the Plan of Subdivision would include approximately 200 residential lots in the form of single detached dwellings within Phase 2. The proposed Zoning By-law Amendment proposes to establish the ‘Urban Residential First Density’ (UR1) with Holding Symbol (H1) on a 0.859 hectares corridor of land fronting Edgewater Boulevard previously identified as Block 158. 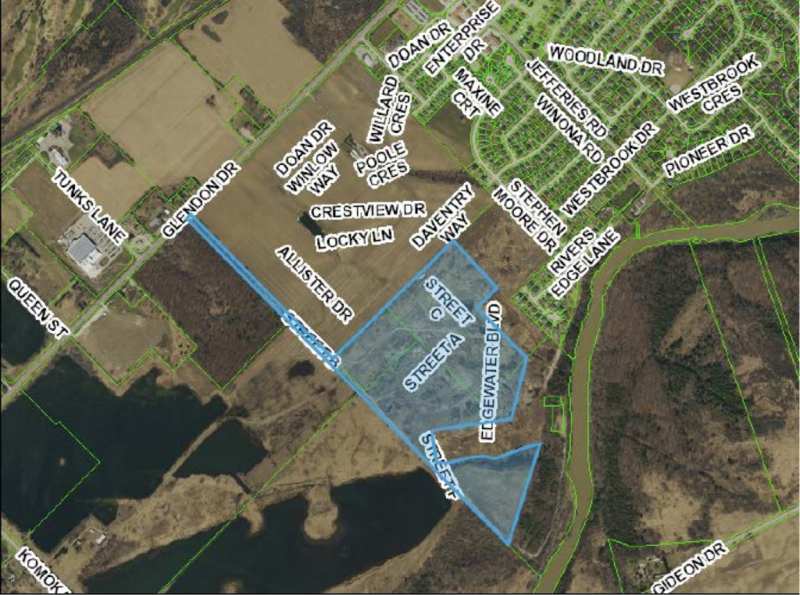 These lands would accommodate eight residential lots, surrounding the southern portion of the stormwater management pond. The Zoning By-law Amendment further proposes to amend the boundaries of the current ‘Urban Residential First Density’ (UR1) and Open Space (OS) and ‘Urban Residential Second Density’ (UR2) with Holding Symbol (H1) zones that were part of the previously approved redline revision. Lastly, adjust the zoning of the boundary for the entrance to Block 244 (previously Block 144, on the southwestern portion of the lands). This is to reflect the removal of the public road and replace it with a private entrance to the multiple residential block. As such, the zoning is to be changed to ‘Urban Residential First Density’ (UR1) with Holding Symbol (H1) to align with the balance of the Block. This private drive would be for the approximately 33 units in the southwest corner of the lands. The changes proposed for the lands in question. The orangey lands would change from open space to adding 8 new homes. The portion to the bottom right where the blue road leads is already slated for ~33 homes. You can review the full document here. 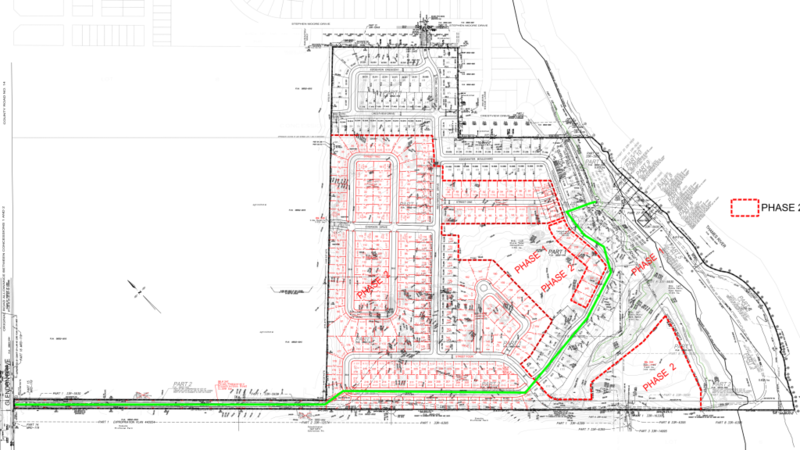 Crestview Dr will be connected to Edgewater Estates through the Kilworth Heights West subdivision (Phase 1). From my conversations with the head of Tridon, Crestview Ave should connect from north to south across their lands by Spring 2019. If EdgeWater follows suit, 2019 should see full connection and reduce anyone’s reliance on Westbrook Dr or Crestview Ave to access EdgeWater Estates. We will see an ultimate increase in traffic, of course, simply due to the large addition of lots. That’s unavoidable. However it should be less than previously thought if Crestview Ave was not connected until 2020 or later. That prior to final approval of Phase 2, the Owner shall construct a Public Recreational Trail commencing from Glendon Drive and extending southerly for a distance of approximately 695 metres and shall also design and construct a dual bike lane and a single sidewalk within the road allowance of Edgewater Boulevard extending to Block 149 to the satisfaction of the Municipality. The coloured path is the planned route for the trail. You can review the detailed drawings here, with the coloured marking provided to me by municipal staff. Jan 22, 2019 Update: Planning staff’s report is now available, with comments from other agencies like Union Gas, Bell, and the Ministry of Natural Resources and Forestry on pages 9 and 10. I think this alleviates some of the concerns, but will likely bring others to the fore. I imagine some of you may feel duped as well, but I guess that’s how we learn that the language in the legal documents is really what counts! If you have any feedback on the above applications, please let me know.